Anywhere else in the country this would be an ordinary local. In London it's got stripped kitchen tables everywhere and pretentions to being a gastro-pub. Unlike other reviewers I saw no guests on, but asked for Brit Hop. This was on the turn, and at £4.10 a pint I had a lucky escape. Chiswick was cheaper, unremarkable and I don't think I'll be returning. 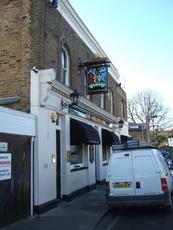 I thought I knew & had been to all the Fuller's pubs in Hammersmith, Chiswick & environs, but this one was new to me on Sunday, & is a real find! Whereas The Thatched House was largely deserted at 12.30pm, The Andover was getting on full by 1pm when my mate & I arrived. And again, whereas we were actually benignly accosted as we entered The Thatched on the assumption we wanted Sunday lunch, no such attitude prevailed at The Andover, despite most people in fact eating at tables. We had two decent pints of Bengal Lancer, a good natter, & the atmosphere was really pretty good! Backstreet Fullers pub that is very cosy and nicely decorated inside. There are snob screens at the bar. Be careful with the 3 entrance doors. Only the middle one will actually open. I stood waiting for the pub to open at midday. But then realised I was trying the wrong door! Unusually for a Fullers pub, they had 2 guest beers - Adnams Southwold Bitter & Castle Rock Preservation Ale. 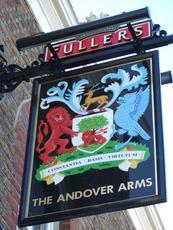 The Fullers beers were London Pride & Chiswick. Aspalls was the cider. There were no other customers here on my Saturday lunchtime visit. But I enjoyed my swift visit here.